The main issue with amplified IC regulator arrangements is high volts drop. The LM317 has a rather high burden voltage in itself, and adding a further transistor and series resistor considerably worsens that. Although, it is a workable arrangement if top efficiency is not important. Yeah, that and the temperature cut off. I take it then that you yourself or anyone that you know has built a successful TL431 PSU. Good evening to you too Tim. Apart from the obvious vref applications in a benign environment, I have never been able to do anything with the TL431 and its family. So, I am biased and, for me it is one of those avoid chips. I wrote a critique of the 431 on ETO a couple of years ago, but can't seem to find it. Here I wrote that I need a current limit. I need current limiting. I dont need current limiting led. I need something like a transistor and a power resistor for current limiting. And I dont need that the current limit to be variable. Got it. I just read all your posts on this thread and afraid I misread one of them. I am having one of those days. Will see if I can pop in some current limiting on the version three circuit (reply #45). (I do in fact sometimes draw schematics; most of these are from my back catalog, hence the simple style.) Which the OP has already been set on the path too -- everything else is just an embellishment of this: adjustable voltage, current limiting, beefed up follower, better pull-up bias, etc. It's just a three-terminal op-amp, no mystery to it. UPDATE #1 2018_12_18 The attached schematic has the opamp input connections reversed- see reply #77 for revised schematic. The common emitter output makes it more like a three terminal operational transconductance amplifier which I think is where people get into trouble frequency compensating it as an error amplifier. It would be interesting to measure the transconductance versus current. It's dominant pole (voltage mode) compensated, so it's a really bad gm amp, at least. It's true at DC, yes (but, DC isn't where we need compensation). Obvious difference: loading the output with C is fine for a gm amp, fatal for a '431! So it's more like an op-amp where they forgot the pull-up / follower part of the output. I was not sure about how much effect the internal compensation had but of course the part has to be unity gain stable. The TI datasheet includes a shmoo plot of stability versus capacitve load which has the typical characteristics of a unity gain compensated operational amplifier with stability the worst at low gains and low output current. If anything, that makes things worse. It is too bad the world could not standardize on something like the LM10; it works well as a shunt reference also. C2, C17 and C15 are 10uF non polarised capacitors ? Does they really need to have such a big value and they really need to be non polarised ? R11, R16, R6, R13 could have a more usual value ? - The common emitter stage inverts the phase so you have to swap inverting and non-inverting inputs. - I've not made any calculations yet, but I think it would be safer to replace some transistors with BD139/40. - Probably it would be hard to compensate. When the op-amp's inputs are reversed, its minimum gain becomes unity. This can be a problem if there is too much gain elsewhere in the loop. I know from recent experience. In the classical floating PSU design, where the opamp inputs are swapped, the overall gain can be set to 0. With the floating type regulator I built recently, the reference ended up on the CV op-amp's inverting input and the voltage feedback divider on the non-inverting input. Even if a large capacitor is connected between its output and inverting input, the AC gain can never go below unity. This isn't a problem in this situation because there is no extra gain between the CV op-amps output and the MOSFET's Gate. For an output limited to a 2.5-25VDC range there is no need of a voltage boost stage. 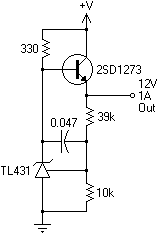 In the circuit below a LED and a diode allow the LM358 go a couple of volts beyond its worst case maximum output. BTW the zener should be at least 2W and the load resistor (1kΩ across the output stage and ground) should be at least 5W. The 2 leds display CV / current limit mode. I forgot to change Q8 (a BC327 would be OK) and to put a reverse diode on the output. That's a neat way of driving the overload LED. Is D11 still needed? It would be adding to the regulators dropout voltage. I am very very impatient to see a final version of this schematic, in order to build it. I can built it only starting from the next week. D11 is still very useful to allow a lower minimum output voltage. Due to the LED, the OP can not pull the voltage down so far. One could get away without if D2 and R14 are also left out. The LED D10 current would than be only limited by the OP internal current limit - should be OK with the LM358, but could be too much with another OP. If worried about the dropout, one could use a separate rectifier and filter stage for the current source around Q7 and Q8. This could give some 1 V extra, as there can be less drop due to ripple. Dumb question since 30v 2-watt zener could be $$... Would jelly bean LM317 and small heat sink be just as stable? Just increase the resistor value, it doesn't need to be that beefy. C4, C7, D7 and D11 also aren't needed (at least not for a -- so far unstated -- ripple spec). It depends on the transformer characteristics since the rectified voltage might drop a lot with a "heavy" load (I set the inner resistance of the voltage source to 0.3Ω to coarsely simulate that). I used just a zener in order to simplify the circuit. Nothing forbids to replace it with a zener/LT431 + BJT for a shunt regulator or a classical 2BJTs + zener series regulator which behaves as a capacitance multiplier providing low ripple even when the input voltage is too low (I've no idea of the behaviour of LM317 in that case). BTW I forgot to add a bleeding resistor to discharge the input capacitors. The capacitor in the constant current source should mitigate a bit the power-on overshot. Later I'll post an updated circuit. You are right about D11. A resistor to limit the LED current is mandatory as LM358 can source up to 60mA according to the datasheet (ST) so it will blow a classical indicator led (and hurt your eyes ). Besides that overloading the output of the LM358 would degrade further its poor characteristics due to the inner thermal gradient. A charge pump might be used to get an higher voltage rail. In that case the constant current source might even be replaced by a resistor since the current variations through it would be much reduced, that is approximately a range of 55V...32.5V / R vs 25V...2.5V / R (to provide 5...27.5V to the base of the darlington). That would also allow to use a low power zener to supply the LM358 thanks to reduced zener current variations. I think what he is getting at is that the non-inverting configuration with a gain of 1 is less stable than the inverting configuration with a gain of -1 which for noise gain purposes is actually a non-inverting gain of 2. This is why some operational amplifiers are not stable as voltage followers and must be used at a minimum non-inverting gain of 2 or inverting gain of -1. A common solution to this is to raise the noise gain by placing a series RC network directly between the inverting and non-inverting inputs. By doing this for instance an OP37 or LT1037 can be used at lower gains even through they are specified for a minimum gain of 5. I have occasionally seen this crop up in power supplies where a specific operational amplifier could not be made stable no matter what was done unless the circuit was changed to raise the noise gain. Here is a more complete circuit. Probably you do not need C12 in the real world as the instability of TL431 on startup would last fraction of seconds, but it was slowing the simulation (since Vdd rises slowly the TL431 doesn't get enough bias and oscillates, that agrees with the datasheet). BTW since the supply voltage of the LM358 is about 5V higher than the maximum output voltage one might even use the second opamp to implement current regulation (worst case max in voltage is Vdd - 2).